YOU don’t need a Gallup Poll or a complete report from the Electoral College to know that Chevrolet must be considered the American buyer’s Number One Choice. No other manufacturer in the world, for that matter, has pumped out as many cars over the past 20 years as this General Motors division. In 1957, after holding Top Spot for 21 years without a break, Chevrolet was toppled from the throne by Ford. But in 1958, with a completely re-styled automobile, Chevy recaptured the sales ball from its perennial opponent—and judging from the 1959 styling changes, it looks as if the Chevrolet boys have made a truly extreme effort to retain possession of the mythical production trophy. The car on which I ran most of my tests was the big Impala with the 348-cu. in. V8 engine and air suspension. This is the Queen Mother of the camp and as wild a departure from earlier models as Santa Claus without a beard. The rear-deck treatment is pure Louis Armstrong—gone, man, gone! Instead of last year’s neatly sculptured, somehow sort of foreign-looking backside, the view from the rear is strictly Spaceship 1989. It carries tremendous horizontal fins which hover over teardrop-shaped tail light clusters to give the whole thing a kind of two-story effect. My first reaction when I saw this rear flight deck, which curves downward from either side in a slow V, was, “What a spot to land a Piper Cub!” It’s crazy—but craziness in good taste. Up front the treatment is also as different as anything you ever saw in a Chevrolet. The four-eyed look is gone. The dual headlights, which last year were mounted slightly above the front point of the sweep spear along the side of the body, have been lowered quite a few inches and are now placed at either end of the grille. Above the grille are narrow slits that look like air intakes, but aren’t, and the directional lights have been tucked into the outside corners of these slits. In last year’s report on the Impala I mentioned the chrome fish-sealers on the front fenders and pointed out that they were so sharp they “could nick the casual do-it-yourself body polisher right across the wrists where the arteries are.” I recommended that they be remodeled with a sledge. I doubt if the Chevy stylists used a sledge but they did blunt the sharp edges and achieved a safer, sleeker, longer and lower look for the ’59 version of these ornaments. Another thing that will stop you dead in your tracks when you first see this ’59 Impala is the enormous area of glass, front and rear. The windshield curves way up and into the roof in really advanced Goldfish Bowl style. The rear window, also only slightly smaller than the big ones at Macy’s 34th Street bazaar, looks very much like the one on the new Buick we tested last month. As the lead picture of this article shows, the combination of front and rear plate glass provides tremendous visibility and a quick way to get suntanned. To test the ’59 Chevrolet, MI Editor Bill Parker joined Jim McMichael and me for our trek to the huge GM Proving Ground at Milford, Mich. After being escorted through the as-always-well-guarded gates, we headed for the Experimental Garage where we later spent some time yakking about racing at Daytona and Indianapolis with Mauri Rose, who competed 16 times at the Indiana Brickyard and won three of the 500-milers (in 1941, 1948 and 1949). Mauri is a GM engineer and headed up Chevrolet’s successful racing team until the Big Three decided to get out of competition last year. Then, with one of Chevrolet’s young engineers and a GM security cop as escorts, we were turned loose on the test track itself. On the first hard turn around GM’s handling course, the Impala shed hubcaps like confetti tossed at a gondolier’s wedding. This was embarrassing but not disastrous. By the time the car is in production the hubcaps, they assured me, will be glued on to stay; the car I was driving was, of course, a pre-production engineering model. The hubcaps, incidentally, have been slotted for better brake cooling, a trick Chevrolet picked up from their racing experience. This big Impala (and it’s bigger than the Cadillac of ten years ago) was equipped with air suspension, a system to which MI readers know I have never been lavishly devoted. It did take all the jolts out of the roughest test roads we went over. But it is my sad duty to report that this ’59 Impala with air bags is not, by a long shot, the best handling or most roadable car Chevrolet has produced. As you readers know, I have always preferred the firm ride to the super-soft or mushy type. For 1959 almost all the manufacturers have gone back to the softer ride. Why? In most auto camps this year—with the notable exception of one— they told me, “Motivational research shows that the average buyer is continually seeking a softer, more comfortable riding car.” I don’t know anything about motivational research but I do know that it is possible to have a top ride, top performance and real comfort all in the same package. There is no reason for sacrificing any of them. In performance, the ’59 Impala does not come up to last year’s car. My 1958 test showed a respectable zero to 60 mph time of 10.4 seconds. In the 1959 car with the big 348-inch engine and a three-carburetor hookup, plus TurboGlide transmission, I averaged 13.1 seconds. 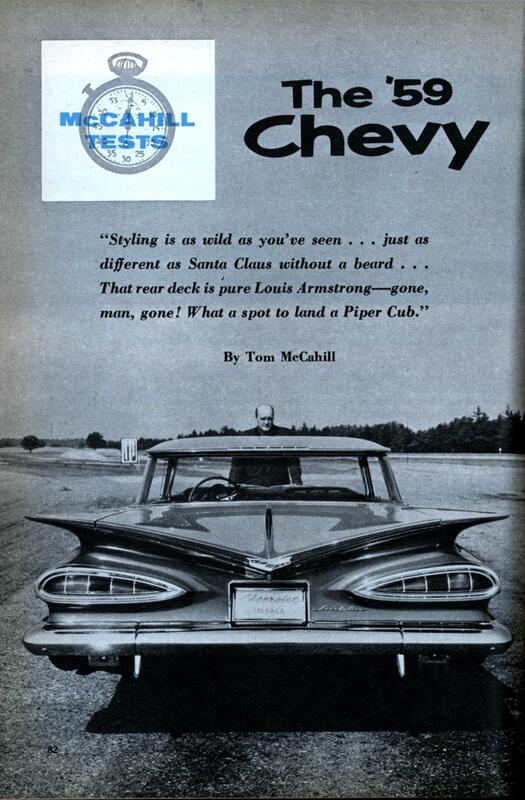 The high-speed track was not available when I made my tests so I cannot report what the ’59 Impala will do flat-out. In all fairness, I must report that for 1959 Chevrolet is also offering the 283-inch wildcat engine (with a hot cam, if you want it), with manual shift and with a choice of either a three-speed or (an innovation this year) a four-speed transmission, about the finest made in this country today. I have no doubt that the right combination of these options will go almost as well as the hot Chevies of old and I wish that I had had a chance to test one of them. I think that a Chevy with the smaller engine, and with coil suspension, would wind up like a siren on a Polish fire engine. Perhaps the reason why the big luxury Impala’s performance has dropped off this year is that they have increased the weight considerably without adding any compensating increase in muscles. The new Impala, which is nearly two inches longer and wider than the ’58, has picked up almost 200 more pounds of weight in the body alone. Except for air conditioning, the rig I tested was loaded with all the accessories. This meant that the big engine added 119 lbs. to the basic weight of 3,655 lbs. ; power brakes, 15 lbs. ; heater, 24; deluxe radio, 13; power seat, 19; power steering, 15; air suspension, 37. (TurboGlide, however, only adds an extra two lbs. over standard transmission, while PowerGlide lumps on 102 lbs. more.) Any way you slice it, the once “little” Chevrolet has become quite a heavy-weight and, with air conditioning and other available stuff, it would be no trick at all to come up with a Chevy weighing well over 4,000 lbs. The brakes on the Impala I tested were excellent, a direct adaptation from the competition Corvette brakes. They are a quarter of an inch wider and as sure of success as a loaded bank account. Inside the car, whose overall height is 56 inches, the front seats have been lowered to accommodate the new silhouette and there is plenty of headroom whether you are sitting in the front or back. The steering wheel, designed and positioned to give a good view of the instrument panel, has a sharper rake—or vertical angle—similar to many foreign sports cars. The compression ratio of the car I tested, with three two-barrel carburetors, was 9.5:1. With the special available camshaft and a four-barrel carburetor, the compression ratio goes as high as 11 to 1. Horsepower on the 11:1 rig is an even 300; the engine on the job I tested put out 280. Fuel injection is still available on the smaller, 283-inch engine. “Spaceship 1989” — I love it. 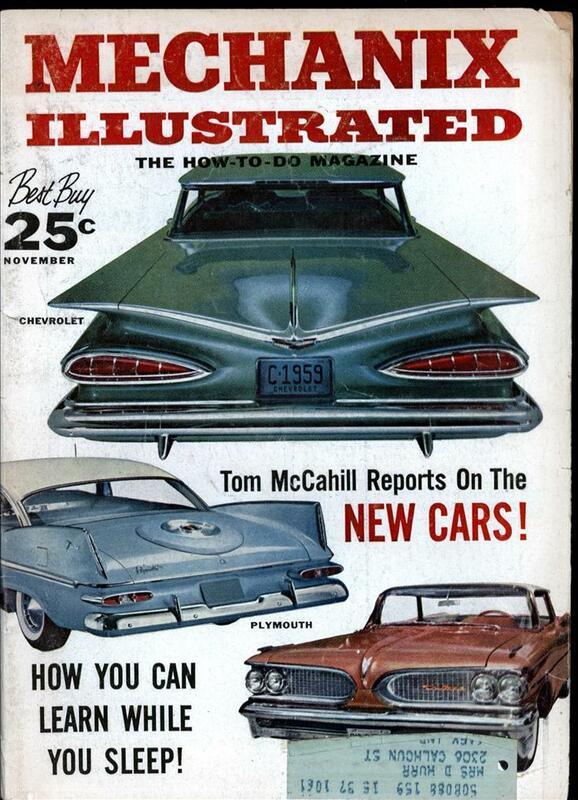 And what would have McCahill (who died in 1975) have thought of the cars of the real 1989, or the cars of today? I think McCahill would have appreciated the improvements in handling, production quality, safety, and fuel consumption. But he’d have hated the fact that for the most part today’s cars have all the style of a used bar of soap. That Chevy’s rear MUST have been the inspiration for Farscapes Dominar Rygel XVI’s eyebrows. with the back bumper shaped like that, how did anybody ever load anything INTO that trunk? This was definitely the ugliest car Chevrolet ever produced. They went from the classic 57 design to this aberration in only 2 years. I often thought that if someone customized the car by removing those ‘toenail’ fins and smoothing out what was left, it would have improved the appearance where the car could have been considered average looking.